Yes, Seattle would love a Sonics' return. But that doesn't diminish the NHL heading there. Even if you’ve never stepped foot in Western Washington, you’re probably aware of just how painful the loss of the Seattle SuperSonics was to the region’s sports fans. I’m sure you know the story, but you don’t really know the feeling. More than any other pro franchise, the Sonics were the heartbeat of the city. League champions in 1979. One of the best regular-season teams in the Western Conference in the mid-90s. Built by Lenny Wilkens, Jack Sikma, Tom Chambers, Gary Payton, Shawn Kemp, and George Karl. Then, to see it all go away after Starbucks impresario Howard Schultz, upset that he couldn’t get taxpayers to buy him a new arena, sold the team to a group of businessmen from Oklahoma City led by Clay Bennett. After one last effort to bilk taxpayers, perhaps knowing in advance that it wouldn’t happen, Bennett moved the franchise to Oklahoma and took Kevin Durant and the entire Sonics legacy with him. It left a void in Seattle sports fans’ hearts that all the Seahawks’ Super Bowl appearances, Seattle Sounders’ MLS titles, and Washington Huskies’ Pac-12 crowns can’t fill. 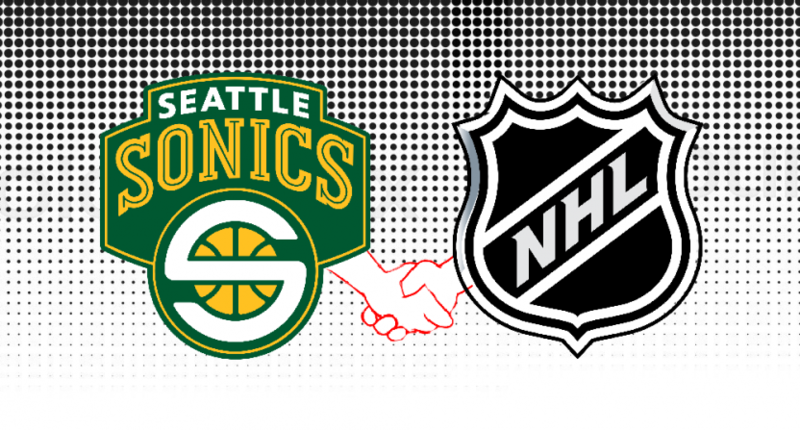 Over the last few years, there’s been a groundswell to not only get the Sonics back but also bring an NHL franchise to Seattle. There was a lot of focus put on getting the NBA team, for obvious reasons. There something so familiar and so necessary about Seattle and the Sonics. Conversely, while the NHL’s potential arrival in Western Washington was always considered welcome, it never quite felt…necessary. At least not to the outside world. We’ve all grown up without the notion of a hockey team in Seattle and gotten pretty used to it. Besides, they can drive up to Vancouver if they want to see the NHL so bad, right? The general reaction from Seattle sports fans on hearing the NHL is coming: "Cool, so what about the NBA and the Sonics?" But that’s not how Seattle sports fans work. Seattle, if you’ve never been, is a city (which you probably know) but it’s a small one (by American standards). You could walk Seattle’s downtown end-to-end in about an hour. Compare that to Chicago or Manhattan, which you’ll spend all day traversing. Also, Seattle’s all the way out there in the northwest corner of the country. Relative to most of the nation’s major cities with multiple pro sports franchises, it’s all by itself (Sorry, Portland). All of that gives Seattle a bit of an outsider vibe. Their sports franchises have gone through some pretty rough eras, much like the city itself. But they’ve stuck it out because anyone who is willing to put Seattle or Washington on their chest is willing to represent the outsider mentality that has driven the city and its residents. Anyone who’s ever spent a Sounders gameday in Pioneer Square will tell you that Seattle fans pour it all into that team. I know it took me by surprise the first time I saw all the scarves and jerseys. But the more I got to know the city the more I understood it. While the Mariners bottomed out, the Seahawks squandered in the middle, and the Sonics disappeared, the Sounders reemerged to give sports fans a chance to find their identity in a “fringe” pro sport (at least in U.S. terms) where they could show the world what it means to rep Seattle. Fans gravitated towards pro soccer for a lot of reasons but part of it was because of the way it felt like something that was uniquely their thing even if it wasn’t everyone else’s. That’s why I have no doubt the NHL will thrive in Seattle. Locals will love the opportunity to root for a brand-new franchise in the “lesser” of the four big pro sports, where they can make their own mark on the league’s fandom. Expect to see the same spirit and excitement that invades Sounders matches and Seahawks games to show up here as well. And it’s not that Seattle fans wouldn’t also love to have the Sonics back. I’ve watched the rallies. I saw how excited they got when a billionaire showed up with the plan to bring them back. And I’ve watched how excited the city has been with the KeyArena renovations and what they mean. Seattle would love to have the Sonics back. But that’s unrelated to their excitement and passion for pro hockey. Familiar or not, Seattle fans are going to flock in droves and the league better get ready for a new fanbase that’s going to bring the noise each night. If anything, the reaction the NHL is about to see is sure to make the NBA wonder why it’s been dragging its heels so much on bringing the Sonics back. Make no mistake. The NHL is not a stopgap for Seattle. It’s a conclusion all its own. If and when the Sonics join this yet-to-be-named team, it’ll be all the sweeter without detracting from who came back first.